We all spend a lot of time focusing on engagement rings, from trends to carat size to which designers make the best ones, but truth be told, you'll probably spend more time wearing your wedding band post-nuptials. The band is usually the ring that makes the cut when you're engaging in an activity that doesn't require much bling (e.g., cycling class). In addition, with the slew of different types of engagement rings available, how to choose a wedding band to pair with it is a big decision. It's easy to assume that a simple round band will do the trick, but that's not always the best option, depending on your engagement ring's shape. To set the record straight, we consulted one of our favorite jewelry designers, Anna Sheffield. (We could stare at her breathtakingly unique designs all day.) 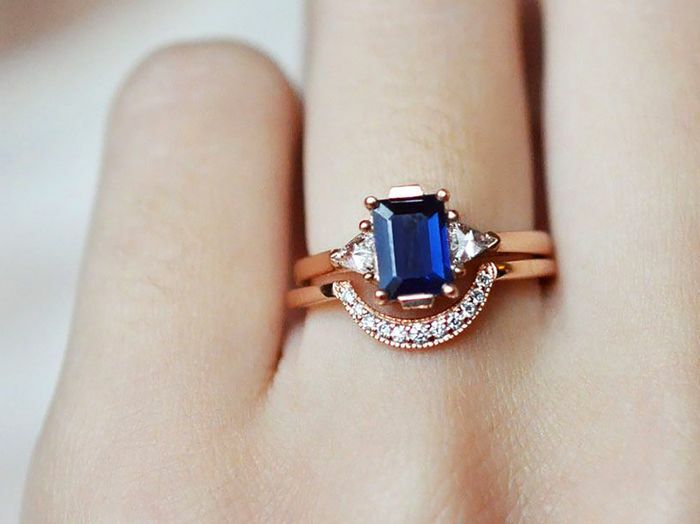 As expected, she knows (and designs) the exact bands to best complement any engagement ring. Keep scrolling to hear her expert advice and to shop rings from her vast collection, as well as additional options based on her recommendations! "The problem solitaires," Sheffield says, "often present when looking for a band is that the cross section is a round or other shape on a slender band. That 'snake that ate an orange' shape means you need a notched band in order for it to sit flush. What I have tried to do is make these feel like beautifully designed rings on their own, so without the solitaire, it's still a lovely piece of jewelry." She continues, "We have a curve band in the collection that's the most versatile for stacking. It's a really elegant shape, not obviously notched, and they come in plain as well as diamond-dusted and even ones made with precious gems. Also, they stack with each other, so you can make a really magnificent set of the curves or layer them with other smaller nesting bands." "Emerald cuts can be peculiar since they're sometimes quite elongated, as marquise often are as well," Sheffield says. She often recommends one of the curved rings from her collection but says that "a notched band with a rectangular shape is nice." We'd have to agree. Perhaps the easiest type of ring to pair with a band, Sheffield says of three-stone rings, "The great thing about your standard three stones, when they're round, is you can wear them with a flat band. In that case, I would recommend playing with metal and diamond color to make a beautiful and maybe even unexpected pairing. For example, when a client loves black diamonds but doesn't want them in an engagement ring, she could select a band with black diamonds. I am personally a fan of mixing metals, so it's also a great opportunity to layer a yellow or rose gold piece with your platinum or vice versa!" "For pear-shaped stones, I have created two options, and sometimes our clients do stacks on both sides," Sheffield says. "The Chevron sits over the V-end of the pear while the Crescent and Grand Tiara nest on the round side." We love the dramatic shape of a chevron when opting for just one band. In the case of an unusually shaped engagement ring, Sheffield confirms that a custom band is the way to go. She says, "I often make custom rings for clients who want to fit a ring with an interesting shape or proportion, or just when they want something more elaborate than we offer in the line." This post was previously published at an earlier date and has since been updated.